Essential oils are the aromatic liquids found within shrubs, flowers, trees, roots, bushes, resins, and seeds. Some people like to call essential oils “nature’s living energy” because they contain unique constituents that provide a host of benefits. Essential oils are volatile, which means that the scent of the oil rises quickly into the air. They are also versatile, with a wide variety of uses. With essential oils you are able to support all body systems, structures and function. Some people use essential oils to enliven an environment, support different body systems, or just for their great scents. Bring life to the body. Are easy to use, safe, and effective. Support us from head to toe—including our emotions, our physical body, and our mental focus. Respect the natural flora of the gut. Essential oils have long been used for cosmetic purposes, as well as for their spiritually and emotionally uplifting properties. This ancient tradition is now reemerging introducing millions to a total mind/body wellness they may never have dreamed possible. A leader in this movement is Young Living. Young Living essential oils are primarily extracted through careful steam distillation but also through cold pressing, the purest essential oils are far more powerful than the botanicals from which they were extracted. Any time you hold a bottle of Young Living's powerful essential oils, you are holding nature's pure essence. The next time you drive by a field of fresh peppermint or hike through a pine forest, breathe deeply—you’re experiencing the soul-soothing power of essential oils. 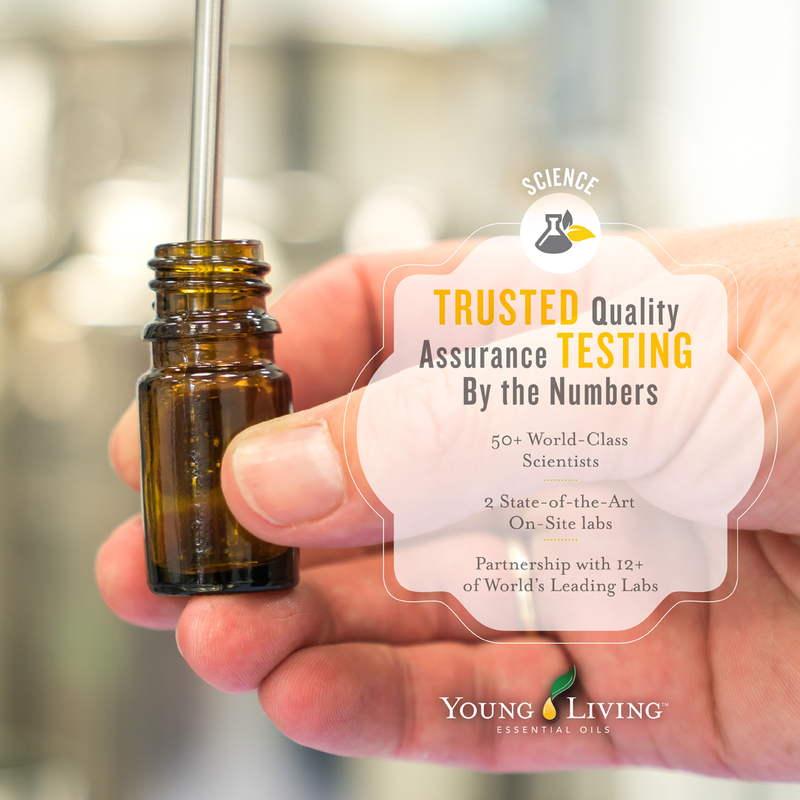 But essential oils are more than nice scents; these powerful plant extracts are your path to the lifelong wellness Young Living has committed to helping you discover. At the intersection of cutting-edge research and traditional wisdom, Young Living formulates targeted, essential oil-based wellness solutions that empower you to dodge harmful chemicals, energize your life, ditch stress and negativity, and reclaim your natural radiance. They provide a wide array of products for your home, wellness, balance, and beauty. What puts Young Living ahead of the others? In our opinion, it is their commitment to producing a quality product with integrity. You find that in their strict adherence to their exclusive 3 Pillars of the Seed To Seal process. It begins with seed selection & planting and ends with sealing the product. 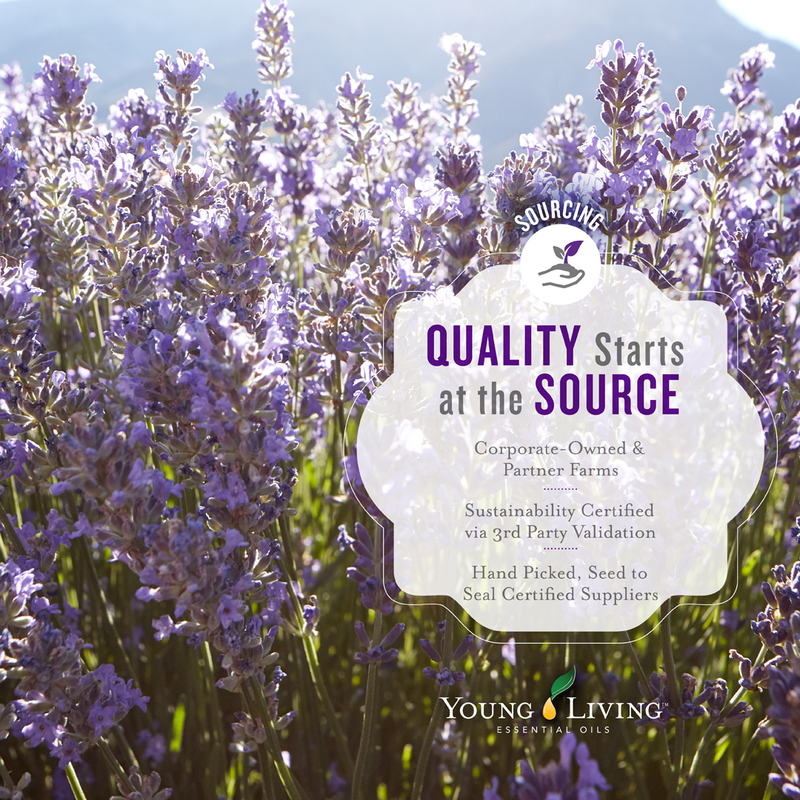 At every step of this production, Young Living is there making sure standards are met. Anywhere along the way if these standards are not met they will not compromise their product. Check out this video that explains the Seed To Seal process. You can learn more about this process here or below the images is a great explanation given by one of our members who is a chemist. How does the supplier company do business? What kind of production and distribution records do they keep? What are the source or sources of the oils they are providing? Many times, YL visits these suppliers on audits. In span of 6 months, YL representatives from the corporate office have visited China, Bulgaria, South Africa, Croatia, Madagascar, Australia, New Zealand, Argentina, UK, Canada, France and Spain. Currently, there are eight partner farms and the newest partner farm is in the Philippines, which will be a source of Elemi. This is where many of you had glazed-over eyes when he started talking about enantiomers, chiral molecules, plant enzymes, GC’s, HPLC’s, Viscometry, Densitometry, Polarimetry, Refractometry, Inductively Coupled Plasma-Mass Spectroscopy, and Isotope ratio Mass Spectometry, just to name a few. It’s not necessarily important to know what all of these techniques are for. If you want to know more about these techniques and what they do, I’d be happy to blog about them in the future, but there are things you can take away from knowing that these instruments are used to test and qualify the oils we enjoy. 1. These instruments aren’t cheap! Just one HPLC with the drivers and software to run it and collect data from it is upwards of $70,000. An Inductively-Coupled Plasma instrument would easily cost $100,000. A Gas Chromatograph-Mass Spectrometer is also $100,000. 2. Individuals that run these instruments don’t come cheap! Most are degreed chemists who have completed a four-year degree at a University. 3. Even highly educated individuals who run these instruments must be trained on how to make the instruments run, how to maintain them and interpret the data that is generated by them. 4. THEY ARE PASSIONATE ABOUT THE DATA THEY GENERATE!! So, what does all this mean to you, the Essential Oil user? You can be assured that when a company invests the kind of money in instrumentation that Young Living has, they WILL use them. Within the last year, they tested a shipment of Peppermint oil and when they were testing for heavy metals (using the ICP), they detected Mercury in the samples. The entire lot was rejected. 7000 Kilograms gone because the specification requires no heavy metals (heavy metals generally refer to Mercury, Cadmium, and Lead). This brings us to the last pillar. Standards can refer to the specifications on a particular lot of an oil, but also refers to standards agreed to by the particular industry, or by governmental authorities. If it weren’t for Young Living, there would be no essential oil industry. Sure, there are other uses for essential oils in the world, such as flavorings for the food industry and for personal care (perfumes and colognes), but not for therapeutic use. 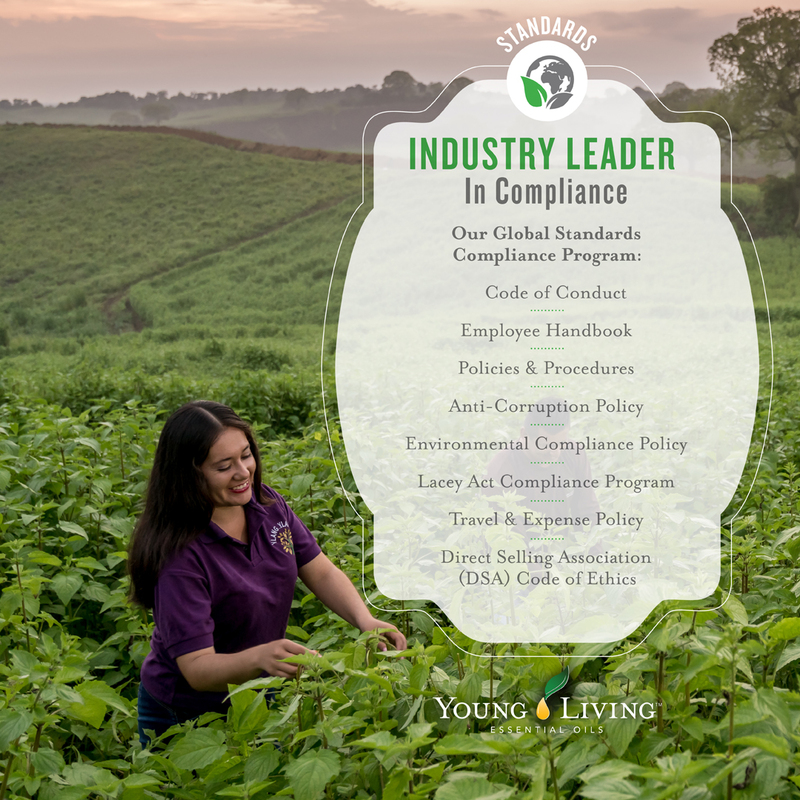 Young Living has set the bar high with regard to setting standards that ensure a sustainable supply chain and compliance with environmental regulations. You can imagine that as many countries that YL works in, there are as many different sets of environmental regulations! The standards are always higher for the “firstborn and YL is always working to review and improve standards as needed. You can begin to appreciate the complexity of the global essential oils market. You can have pride in the fact that YL has set high standards for the rest of the industry-no one else comes close! 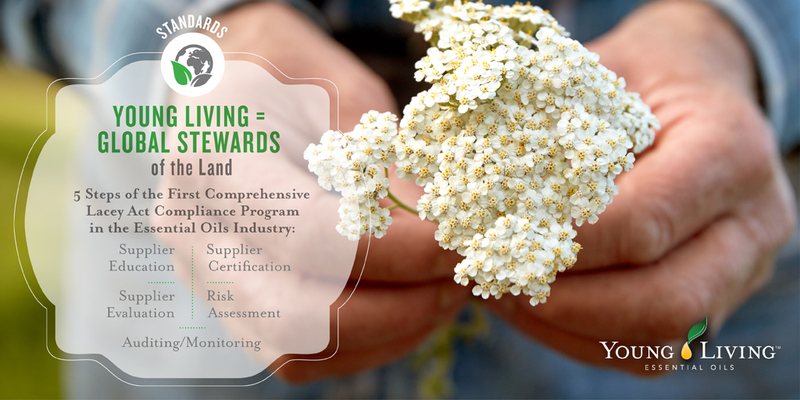 With the three pillars of Sourcing, Science and Standards, you can have confidence and comfort that YL is committed to creating and maintaining sustainable business practices that are both good for the land, environment as well as good for you, your business and your family.